All LAMPTON FARMS homes currently listed for sale in South Jordan as of 04/18/2019 are shown below. You can change the search criteria at any time by pressing the 'Change Search' button below. "Unique, beautiful home located in great South Jordan neighborhood. It is close to I-15, Southtowne Mall, diverse Restaurants. Trax, Front Runner and as an extra bonus, the Jordan River trail. Sellers have updated the furnace, air conditioner, stove (extra nice gas), dishwasher, bathrooms (up & down), garage door (with new opener) and 2 water heaters within the last 3 years. Windows were updated in 2009. ROOF WILL BE REPLACED SOON. Buyer can determine color if under contract before installed. FULL PRICE OFFER WILL INCLUDE NEW PAINT AND A NEW FINISH ON THE FLOOR (main floor only) When the offer is secure buyer can determine color of both. PRESSURIZED IRRIGATION is also included with the purchase of the home with a yearly fee of 200$ (Huge water bill savings). 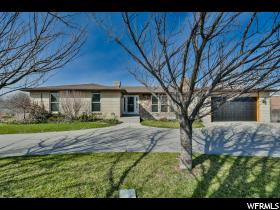 This home sits on a half acre and in South Jordan this means you can have up to one horse or other large animal. With the pressurized irrigation, large lot and all major items in the home updated, this home will make a great new home for you! Come check it out! "